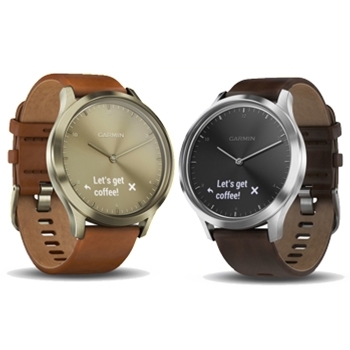 The Garmin Vivomove HR, Premium Hybrid Smartwatch provides in depth activity tracking, weather features, heart rate monitoring and more all within one leather banded watch. A sophisticated touchscreen display discreetly shows your health stats when prompted to do so. Simply swipe the touchscreen to move the clock display out of the way to reveal fitness stats and notifications. When you are finished viewing your activity stats the clock will reappear keeping your stats private. Track your movement throughout the day and your sleep at night. Use this information to stay on track by setting personal goals. Bluetooth enabled, the Vivomove Premium will display text messages and more on your compatible smartphone. Built in sensors like the wrist enabled heart monitor, barometric altimeter and accelerometer ensure accuracy at all times. Not only will your HR Premium Hybrid Smartwatch monitor your heart rate but it will also track stress levels throughout your day. Use this data to recognize peak stress you can also view stress levels throughout the day. See peak times at which stress levels are higher than normal and find ways to modify your lifestyle to keep these levels down. The Garmin Vivomove Premium HR Hybrid Smartwatch is a perfect watch for anyone interested in wearing a sophisticated watch while monitoring all aspects of your fitness goals. Each Garmin Vivomove,Premium HR Hybrid Smartwatch comes with: Garmin Vivomove HR, Premium Hybrid Smartwatch in your choice of color and size, Charging Cable, Documentation and a One-Year Manufacturer’s Warranty.